This Gothic Revival style building has one plus stories, an asphalt shingle roof and is intact. It is two-bay. 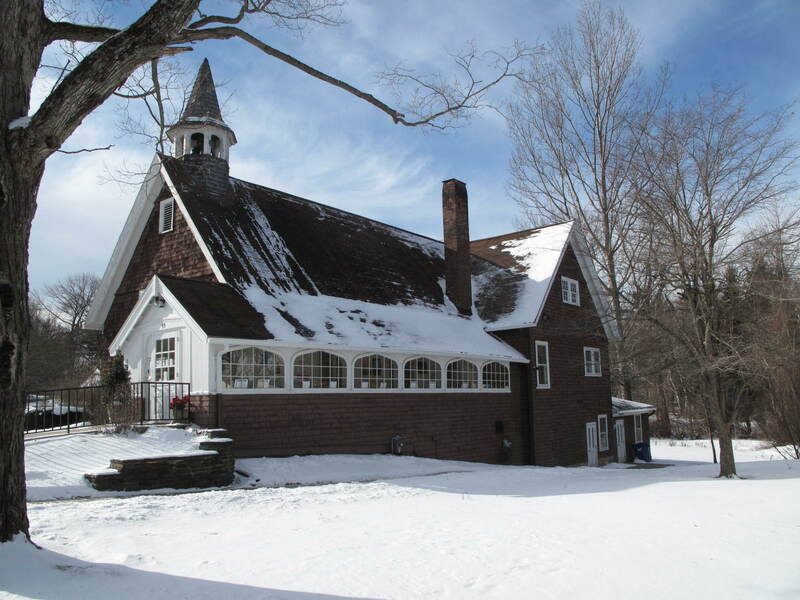 It has a wood frame; cross-gable roof with exposed rafter ends, and a steeply pitched front gable. It has a stone-clad octagonal bell tower with hipped “witches hat” roof with wood shingles and exposed rafter ends. It has a one-story entrance pavilion that extends along the right side to the rear wing and forward of the main building with a series of six 18-light Tudor-arched windows on the right side, one on the left side with a wood shingled kneewall below. The front door surround has dentils on a slightly peaked header, exposed rafter ends, and a paneled verge board with king post on its narrow front. There is a brick side wall chimney on the right side at the inside corner of the main and right wing sections. The front facade of the main section has set of three stained glass windows. The left side facade features three paired windows with double gable/peaked headers. The rear cross wing is two bays deep, and has an exposed basement with ground-level access. There is a one-story rear ell at the basement level. A stone retaining wall extends and curves forward from the front rightt corner of the entrance pavilion. Designed by Pittsfield architect, J. F. Rathbone [Rathbun?]. More research needed to clarify architect information on original Form B. Can’t find record of J. F. Rathbone and Rathbun’s initials are C. T. (Charles T. Rathbun). This was originally the site of the Lenox Library which was housed in an octagonal building. The Congregational Society purchased the property after the library moved to the Second County Courthouse building in 1873. Construction of the Chapel was authorized by the Congregational Society in 1876, “in response to a felt need for a center for social activities.” The foundation of the chapel was constructed from the brick and stone of the old library building. The Chapel was used primarily as a meeting place until the turn of the century, when it was modernized. Following this modernization, the Chapel was used for Sunday services, as the Church on the Hill was inadequately heated and the congregation had become quite small. The Chapel was damaged by fire in 1930 and then restored. In the 1950’s oil heat was installed at the Church on the Hill and services returned to that building. A Church School held in the Chapel had increased its enrollment to the point that it overflowed the building by 1968. The interior of the Chapel was remodeled at this time to accommodate the school activities.